Inside the Syncope project, a musical program in five events, dedicated to contemporary artistic experiences which break the circle of harmony and tradition, on Sunday 24th of March Rome’s Istituto Svizzero presents the TAM TUUMB! Project, a series of performances on the centenary of Luigi Russolo’s “The Art of Noise” publishing. In 1913 the Futurist Luigi Russolo published a manifesto, “The Art of Noise”. For Russolo, to fully reject the harmonic and melodic codes that still governed the 18th-century musical tradition, the time had come to «break at all cost from this restrictive circle of pure sounds and conquer the infinite variety of noise-sounds» whose power, according to the artist, could «bring us back to life». His insight pointed to many later developments in 20th-century music, making him become the godfather and demiurge of entire currents: from musique concrète to industrial music, all the way to the contemporary forms of noise music. In particular, from the start of the 2000s on, the most heretical circuits of underground music have gone through a genuine noise Renaissance, whose impact has been unprecedented in the balances of the new sounds produced outside academic musical circles, including electronic, rock or generically experimental music. And Russolo’s name is still there, revered and honored by a generation of musicians that has taken the Art of Noise to its extreme consequences: reinterpreting, reinventing and – why not – betraying it. One hundred years after the publication of one of the most influential manifestos in the history of music, TAM TUUMB! offers a chance to take stock of a lively phenomenon, one with an unpredictable impact on the musical research of the new millennium, while paying tribute to one of the most revolutionary, visionary and farsighted forefathers of the Italian avant-garde, widely acclaimed abroad though curiously overlooked in his native land. The idea is to go back to the points listed by Russolo himself, in his manifesto dated 1913, and to see how musicians of the two latest generations have reinterpreted them, achieving surprising solutions and results that go beyond mere sound effects, in a return to the authentic spirit of the Italian Futurist: that of «enrich[ing] men with a new voluptuousness they did not suspect existed». According to Russolo, «the art of noises must not be limited to a mere imitative reproduction. The art of noises will extract its main emotive power from the special acoustic pleasure that the inspired artist will obtain in combining noises». Russolo identified a long series of families of noises, in a sonic spectrum that ranged from «roars, bellows, claps» to «animal and human voices». In these families, we have found – in our opinion – the descendents that seem most original, interesting or influential in historical terms, alternating already historic cases with others in a state of becoming, and crossing experiences from different places, backgrounds and times. Aaron Dilloway (USA): Probably the most important noise artist of the last decade, Dilloway was one of the founders of the group Wolf Eyes and now works as a soloist using analog electronics, tapes and loops. Cut Hands (UK): On the borderline between electronics, tribal repetition and noise primitivism, Cut Hands is the latest project of the English musician William Bennett. Active since the early 1980s under the name Whitehouse, Bennett is perhaps the most influential figure in the development of today’s non-academic «noise music». Skullflower (UK): A historic name of the British underground, Skullflower have been and remain the leading exponents of the Broken Flag aesthetic, a label that since the 1980s has crossed the cruder aspects of so-called industrial music with a guitar-based, if not always rock, matrix. Teho Teardo (ITA): Essential figure of Italian underground since the Eighties, Teho Teardo is also one of the most respected composers of soundtracks for cinema. For the centenary of “The Art of Noise” he will present in first preview a live mixing of OH, a composition for sixteen “intonarumori” (sound generators invented at the beginning of XXth century by Luigi Russolo himself) and also a selection of new releases. Andy Guhl (CH): Found in the 190s of the duo Voice Crack, Guhl represents one of the most courageous adventures of the European avant-garde, mixing a background in free improve with studies and experiences related to musique concrète. Dave Phillips (CH): One of the leading figures of Swiss extreme music since the 1980s, member of the historic Schimpfluch-Gruppe, Dave Phillips works between performance in the actionist tradition and disturbing field recordings. Antoine Chessex (CH): A composer and sound artist whose work ranges from pieces for instrumental ensembles to installations. One of the founders of the Swiss group Monno. He now lives in Berlin. Die Schachtel (ITA): Label born in Milan in 2003, Die Schachtel has rapidly grown up as one of the reference names in the avant-garde and experimental range. 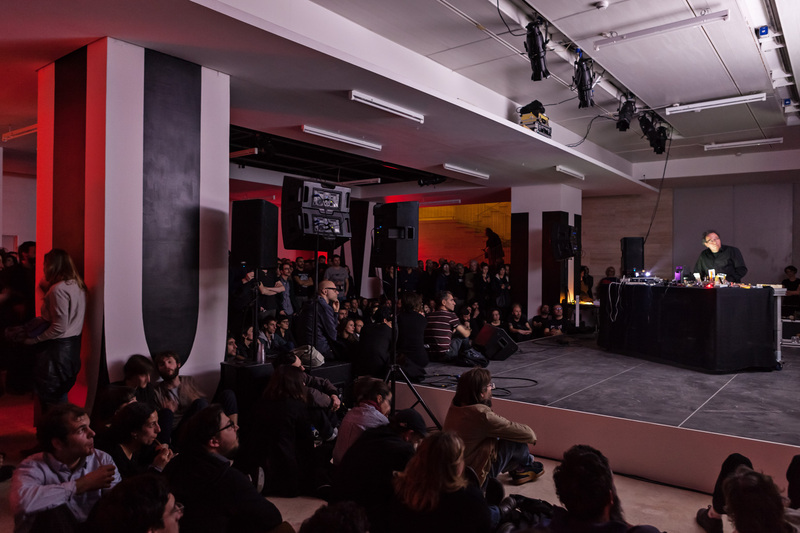 For TAM TUUMB!, its founders Fabio Carboni and Bruno Stucchi will sonorize the setting of the Istituto Svizzero with an inventory picking both amongst historical reprints, and new protagonists of international experimental music. Susanne Vécsey & Christoph Schmidt (CH): They found their architectural practice ‘Vécsey Schmidt Architekten’ in Basel in 2007. Besides competitions and building projects they also work on theoretical issues of Architecture. With a simple intervention, the application of room-high letters on the existing pillars, their seperating impact is dissolved in favour of the overall space. Dioganally viewed the characters unfold an abstract, sculptural expression. The letters refer to the title of the concert which for his part is borrowed from a poem of the Italian futurist Filippo Tomasso Marinetti.